An earthquake is the result of a sudden release of stored energy in the Earth's crust that creates seismic waves. At the Earth's surface, earthquakes may manifest themselves by a shaking or displacement of the ground. Sometimes, they cause tsunamis, which may lead to loss of life and destruction of property. An earthquake is caused by tectonic plates getting stuck and putting a strain on the ground. The strain becomes so great that rocks give way by breaking and sliding along fault planes. Earthquakes are measured with a seismometer, commonly known as a seismograph. Earthquakes may occur naturally or as a result of human activities. Smaller earthquakes can also be caused by volcanic activity, landslides, mine blasts, and nuclear tests. In its most generic sense, the word earthquake is used to describe any seismic event—whether a natural phenomenon or an event caused by humans—that generates seismic waves. An earthquake's point of initial ground rupture is called its focus or hypocenter. The term epicenter means the point at ground level directly above this. Most naturally occurring earthquakes are related to the tectonic nature of the Earth. Such earthquakes are called tectonic earthquakes. The Earth's lithosphere is a patchwork of plates in slow but constant motion caused by the release to space of the heat in the Earth's mantle and core. The heat causes the rock in the Earth to become flow on geological timescales, so that the plates move, slowly but surely. Plate boundaries lock as the plates move past each other, creating frictional stress. When the frictional stress exceeds a critical value, called local strength, a sudden failure occurs. The boundary of tectonic plates along which failure occurs is called the fault plane. When the failure at the fault plane results in a violent displacement of the Earth's crust, the elastic strain energy is released and seismic waves are radiated, thus causing an earthquake. This process of strain, stress, and failure is referred to as the Elastic-rebound theory. It is estimated that only 10 percent or less of an earthquake's total energy is radiated as seismic energy. Most of the earthquake's energy is used to power the earthquake fracture growth and is converted into heat, or is released to friction. Therefore, earthquakes lower the Earth's available potential energy and raise its temperature, though these changes are negligible. Earthquakes may also occur in volcanic regions and are caused there both by tectonic faults and by the movement of magma in volcanoes. Such earthquakes can be an early warning of volcanic eruptions. 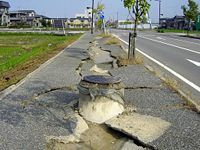 A recently proposed theory suggests that some earthquakes may occur in a sort of earthquake storm, where one earthquake will trigger a series of earthquakes each triggered by the previous shifts on the fault lines, similar to aftershocks, but occurring years later, and with some of the later earthquakes as damaging as the early ones. Such a pattern was observed in the sequence of about a dozen earthquakes that struck the North Anatolian Fault in Turkey in the twentieth century, the half dozen large earthquakes in New Madrid in 1811-1812, and has been inferred for older anomalous clusters of large earthquakes in the Middle East and in the Mojave Desert. The number of seismic stations has increased from about 350 in 1931 to many thousands today. As a result, many more earthquakes are reported than in the past because of the vast improvement in instrumentation (not because the number of earthquakes has increased). The USGS estimates that, since 1900, there have been an average of 18 major earthquakes (magnitude 7.0-7.9) and one great earthquake (magnitude 8.0 or greater) per year, and that this average has been relatively stable. In fact, in recent years, the number of major earthquakes per year has actually decreased, although this is likely a statistical fluctuation. More detailed statistics on the size and frequency of earthquakes is available from the USGS. 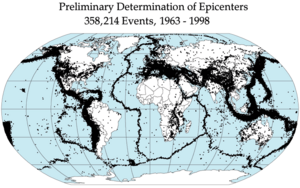 Most of the world's earthquakes (90 percent, and 81 percent of the largest) take place in the 40,000-km-long, horseshoe-shaped zone called the circum-Pacific seismic belt, also known as the Pacific Ring of Fire, which for the most part bounds the Pacific Plate. Massive earthquakes tend to occur along other plate boundaries, too, such as along the Himalayan Mountains. 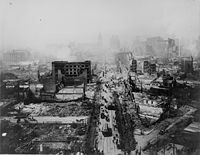 Smoldering after the 1906 San Francisco earthquake. Man walking around in Ruins after Tsunami. Following an earthquake, fires can be generated by break of the electrical power or gas lines. Soil liquefaction occurs when, because of the shaking, water-saturated granular material temporarily loses their strength and transforms from a solid to a liquid. Soil liquefaction may cause rigid structures, as buildings or bridges, to tilt or sink into the liquefied deposits. See, for example, the 2004 Indian Ocean earthquake. Basel earthquake (1356). Major earthquake that struck Central Europe in 1356. Carniola earthquake (1511). A major earthquake that shook a large portion of South-Central Europe. Its epicenter was around the town of Idrija, in today's Slovenia. It caused great damage to structures all over Carniola, including Ljubljana, and minor damage in Venice, among other cities. Shaanxi Earthquake (1556). Deadliest known earthquake in history, estimated to have killed 830,000 in China. Dover Straits earthquake of 1580 (1580). Kamchatka earthquakes (1737 and 1952). Lisbon earthquake (1755), one of the most destructive and deadly earthquakes in history, killing between 60,000 and 100,000 people and causing a major tsunami that affected parts of Europe, North Africa, and the Caribbean. New Madrid Earthquake (1811) and another tremor (1812), both struck the small Missouri town, reportedly to been the strongest ever in North America and made the Mississippi River temporarily change its direction and permanently altered its course in the region. Fort Tejon Earthquake (1857). Estimated Richter Scale above 8, said the strongest earthquake in Southern California history. Owens Valley earthquake (1872). Might been strongest ever measured in California with an estimated Richter Scale of 8.1 said seismologists. Charleston earthquake (1886). Largest earthquake in the southeastern United States, killed 100. Ljubljana earthquake (14. IV. 1895), a series of powerful quakes that ultimately had a vital impact on the city of Ljubljana, being a catalyst of its urban renewal. Assam earthquake of 1897 (1897). Large earthquake that destroyed all masonry structures, measuring more than 8 on the Richter scale. The 1988 Spitak earthquake claimed over 25,000 lives and left 500,000-plus homeless. San Francisco Earthquake (1906). Between 7.7 and 8.3 magnitudes; killed approximately 3,000 people and caused around $400 million in damage; most devastating earthquake in California and United States history. Messina Earthquake (1908). Killed about 60,000 people. Great Kantō earthquake (1923). On the Japanese island of Honshū, killing over 140,000 in Tokyo and environs. Napier earthquake (1931). 256 dead. 1939 Erzincan earthquake at Erzincan, Turkey measuring 7.9 on the Richter Scale. Assam earthquake of 1950 (1950). Earthquake in Assam, India measures 8.6M. Kamchatka earthquakes (1952 and 1737). Great Kern County earthquake (1952). This was second strongest tremor in Southern California history, epicentered 60 miles North of Los Angeles. Major damage in Bakersfield, California and Kern County, California, while it shook the Los Angeles area. Great Chilean Earthquake (1960). Biggest earthquake ever recorded, 9.5 on Moment magnitude scale, and generated tsunamis throughout the Pacific Ocean. 1960 Agadir earthquake, Morocco with around 15,000 casualities. Skopje earthquake of 1963, measuring 6.1 on the Richter Scale kills 1,800 people, leaves another 120,000 homeless, and destroys 80 percent of the city. Good Friday Earthquake (1964) In Alaska, it was the second biggest earthquake recorded, measuring 9.2M. and generated tsunamis throughout the Pacific ocean. Ancash earthquake (1970). Caused a landslide that buried the town of Yungay, Peru; killed over 40,000 people. Sylmar earthquake (1971). Caused great and unexpected destruction of freeway bridges and flyways in the San Fernando Valley, leading to the first major seismic retrofits of these types of structures, but not at a sufficient pace to avoid the next California freeway collapse in 1989. Managua earthquake (1972), which killed more than 10,000 people and destroyed 90 percent of the city. The earthquake took place on December 23, 1972 at midnight. Friuli earthquake (1976), Which killed more than 2.000 people in Northeastern Italy on May 6. Tangshan earthquake (1976). The most destructive earthquake of modern times. The official death toll was 255,000, but many experts believe that two or three times that number died. Guatemala 1976 earthquake (1976). Causing 23,000 deaths, 77,000 injuries and the destruction of more than 250,000 homes. Coalinga, California earthquake (1983). 6.5 on the Richter Scale on a section of the San Andreas Fault. Six people killed, downtown Coalinga, California devastated and oil field blazes. Great San Salvador Earthquake (October 10, 1986). Killed over 1,500 people. 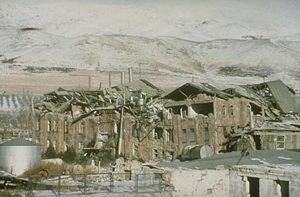 Armenian earthquake (1988). Killed over 25,000. Loma Prieta earthquake (1989). Severely affecting Santa Cruz, San Francisco and Oakland in California. This is also called the World Series Earthquake. It struck as Game 3 of the 1989 World Series was just getting underway at Candlestick Park in San Francisco. Revealed necessity of accelerated seismic retrofit of road and bridge structures. Luzon Earthquake (1990). On July 16, 1990, an earthquake measuring 7.7 on the Richter Scale struck the island of Luzon, Philippines. Landers, California earthquake (1992). Serious damage in the small town of Yucca Valley, California and was felt across 10 states in Western United States. Another tremor measured 6.4 struck 3 hours later and felt across Southern California. August 1993 Guam Earthquake, measuring 8.2 on the Richter Scale and lasting 60 seconds. Northridge, California earthquake (1994). Damage showed seismic resistance deficiencies in modern low-rise apartment construction. Great Hanshin earthquake (1995). Killed over 6,400 people in and around Kobe, Japan. Athens earthquake (1999). 5.9 on the Richter Scale, it hit Athens on September 7. Epicentered 10 miles north of the Greek capital, it claimed 143 lives. Chi-Chi earthquake (1999) Also called the 921 earthquake. Struck Taiwan on September 21 1999. Over 2,000 people killed, destroyed or damaged over 10,000 buildings. Caused world computer prices to rise sharply. Armenia, Colombia (1999) 6.2 on the Richter Scale, killed over 2,000 in the Colombian Coffee Grown Zone. 1999 İzmit earthquake measuring 7.4 on the Richter Scale and killed over 17,000 in northwestern Turkey. Hector Mine earthquake (1999). 7.1 on the Richter Scale, epicentered 30 miles east of Barstow, California, widely felt in California and Nevada. 1999 Düzce earthquake at Düzce, Turkey measuring 7.2 on the Richter Scale. El Salvador earthquakes (2001). 7.9 (January 13) and 6.6 (February 13) magnitudes, killed more than 1,100 people. Gujarat Earthquake (January 26, 2001). Hindu Kush earthquakes (2002). Over 1,100 killed. Molise earthquake (2002) Twenty-six killed. Bam Earthquake (2003). Over 40,000 people are reported dead. Parkfield, California earthquake (2004). Not large (6.0), but the most anticipated and intensely instrumented earthquake ever recorded and likely to offer insights into predicting future earthquakes elsewhere on similar slip-strike fault structures. Sumatra-Andaman Earthquake (December 26, 2004). Second largest earthquake in recorded history registering a moment magnitude of 9.3. Epicentered off the coast of the Indonesian island of Sumatra, this massive temblor triggered a series of gigantic tsunamis that smashed onto the shores of a number of nations, causing more than 285,000 fatalities. Kashmir earthquake (2005) (also known as the Great Pakistan earthquake). Killed over 79,000 people; and many more injured. May 2006 Java earthquake (2006). July 2006 7.7 magnitude Java earthquake which triggered tsunamis (2006). September 2006 6.0 magnitude Gulf of Mexico earthquake (2006). October 2006 6.6 magnitude Kona, Hawaii earthquake (2006). November 2006 8.1 magnitude north of Japan (2006). December 26, 2006, 7.2 magnitude, southwest of Taiwan (2006). February 12, 2007, 6.0 magnitude, southwest of Cape St. Vincent, Portugal (2007). Sumatra Earthquakes March 06, 2007, 6.4 and 6.3 magnitude, Sumatra, Indonesia (2007). March 25, 2007, 6.9 magnitude, off the west coast of Honshū, Japan (2007). April 1, 2007, 8.1 magnitude, Solomon Islands (2007). In Norse mythology, earthquakes were explained as the violent struggling of the god Loki. When Loki, god of mischief and strife, murdered Baldr, god of beauty and light, he was punished by being bound in a cave with a poisonous serpent placed above his head dripping venom. Loki's wife Sigyn stood by him with a bowl to catch the poison, but whenever she had to empty the bowl the poison would drip on Loki's face, forcing him to jerk his head away and thrash against his bonds, causing the earth to tremble. In Greek mythology, Poseidon was the god of earthquakes. In Christianity, certain saints were invoked as patrons against earthquakes, including Saint Gregory Thaumaturgus, Saint Agatha, Saint Francis Borgia, and Saint Emygdius. ↑ William Spence, S. A. Sipkin, and G. L. Choy, 1989, Measuring the Size of an Earthquake. United States Geological Survey. Retrieved August 10, 2007. ↑ H. W. Greene, and P. C. Burnley. 1989. A new self-organizing mechanism for deep-focus earthquakes. Nature. 341:733-737. ↑ Earthquake Hazards Program. USGS. Retrieved August 10, 2007. ↑ Common Myths about Earthquakes. USGS. Retrieved August 10, 2007. ↑ Earthquake Facts and Statistics: Are earthquakes increasing?. USGS. Retrieved August 10, 2007. 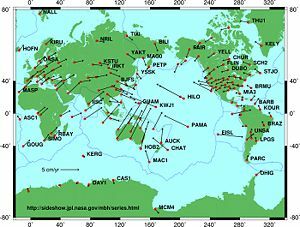 ↑ Historic Earthquakes and Earthquake Statistics: Where do earthquakes occur? USGS. Retrieved August 10, 2007. ↑ Glossary - Ring of Fire. USGS. Retrieved August 10, 2007. ↑ 8.0 8.1 Largest Earthquakes in the World Since 1900. USGS. Retrieved August 10, 2007. ↑ Poseidon. Theoi Project. Retrieved August 10, 2007. ↑ Patron Saint Index Topic. SQPN. Retrieved August 10, 2007. Bolt, Bruce A. 2003. Earthquakes. 5th ed. New York: W.H. Freeman. ISBN 0716756188. Hough, Susan Elizabeth. 2004. Earthshaking Science: What We Know (and Don't Know) about Earthquakes. Princeton, NJ: Princeton University Press. ISBN 0691118191. Kanamori, Hiroo, and Emily E. Brodsky. 2001. The Physics of Earthquakes. Physics Today 54:34. Scholz, C. H. 2002. The Mechanics of Earthquakes and Faulting. Cambridge, UK: Cambridge University Press. ISBN 0521652235. Earthquakes – an educational booklet by Kaye M. Shedlock & Louis C. Pakiser. The Severity of an Earthquake. How Do I Locate That Earthquake's Epicenter? Geo.Mtu.Edu. earthquakecountry.info – Answers to FAQs about Earthquakes and Earthquake Preparedness. Virtual Earthquake – educational site explaining how epicenters are located and magnitude is determined. Real-time earthquakes on Google Map, Australia and rest of the world. This page was last modified on 26 September 2017, at 15:28.